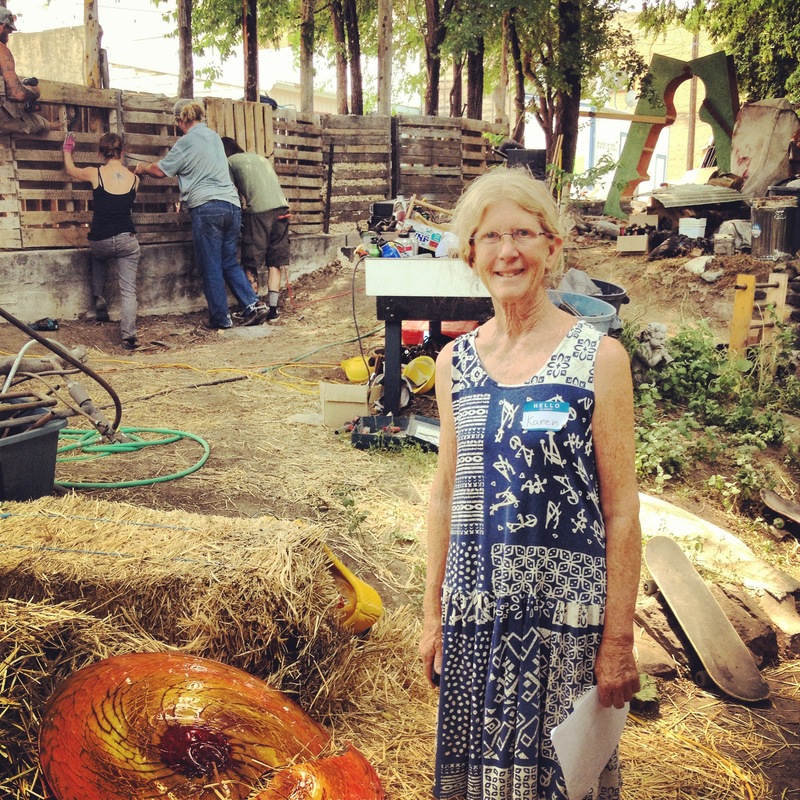 The Art Wall and the North Fork Valley Creative Coalition. Robert Frost’s old adage that “Good fences make good neighbors” has proven true in downtown Paonia, where the Art Wall is nearing completion. Local artists and community members have been working hard to transform the alleyway next to Elsewhere Studios and behind Waldo’s into a beautiful artscape. 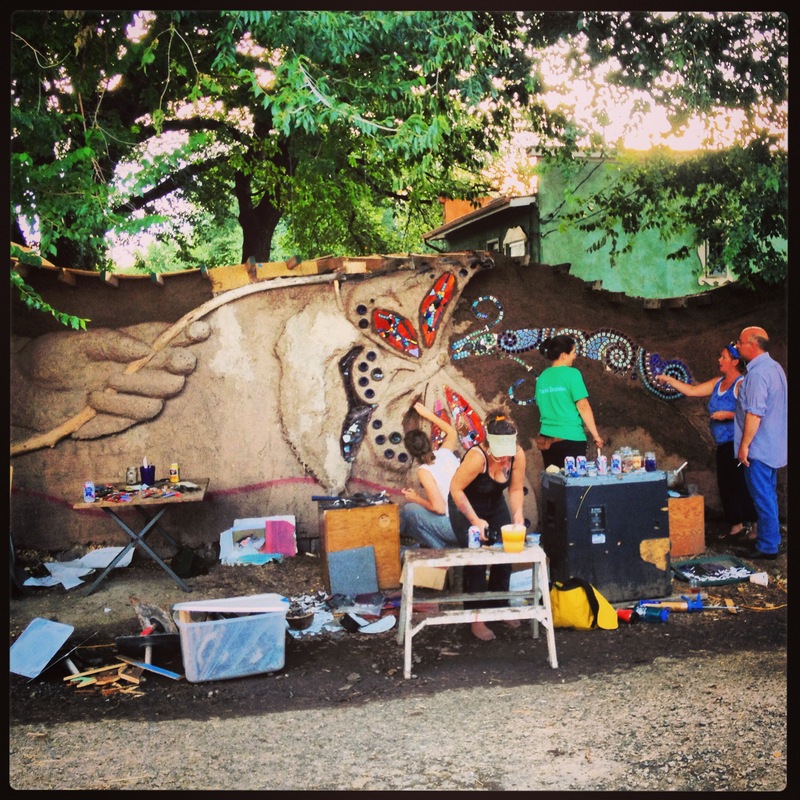 The Art Wall is part mural, part fence, and just like the fence in Robert Frost’s Mending Wall, the building of the Art Wall has been a reason for the community to come together—to mend a downtown alley and create something beautiful. The Art Wall was inspired by the Village Building Convergence that happens each year in Portland, Oregon. These festival –style events, complete with music and food, bring together a neighborhood to reclaim and beautify neglected areas. The alley next to Elsewhere Studios in Paonia is the first part of a bigger alleyway artscape project planned for the town. The town of Paonia and all the businesses that access this alleyway see value in this project and have been supportive. This Art Wall will eventually extend down the entire alley to the Living Farm Café. A collaboration between the North Fork Valley Creative Coalition, Elsewhere Studios and the Town of Paonia, the Art Wall is a showcase of local talent and creativity. 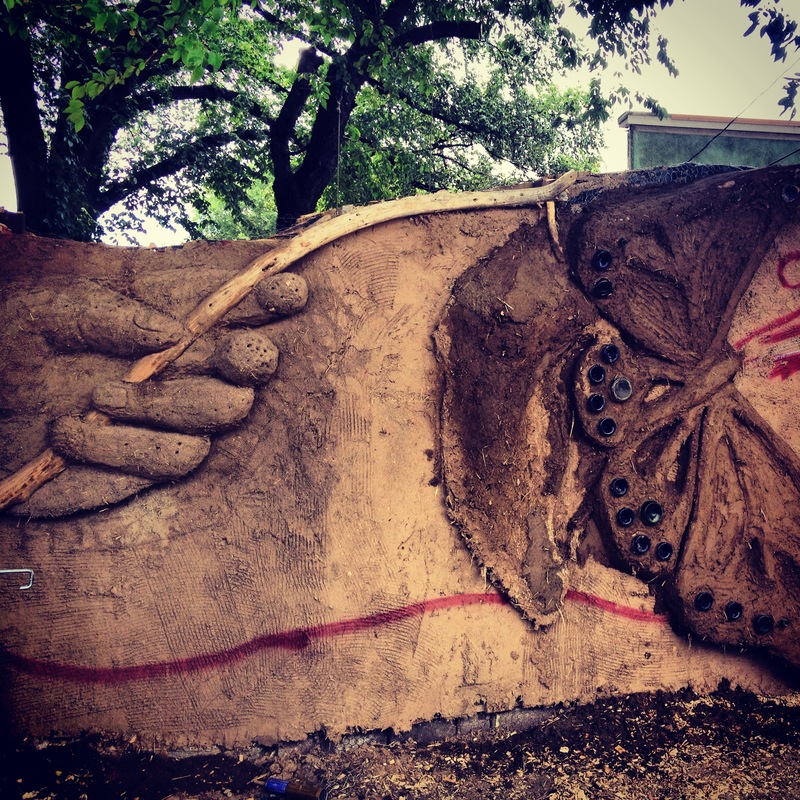 Straw bales and pallets stuffed with woodchips were used to create the basic shape of the wall. 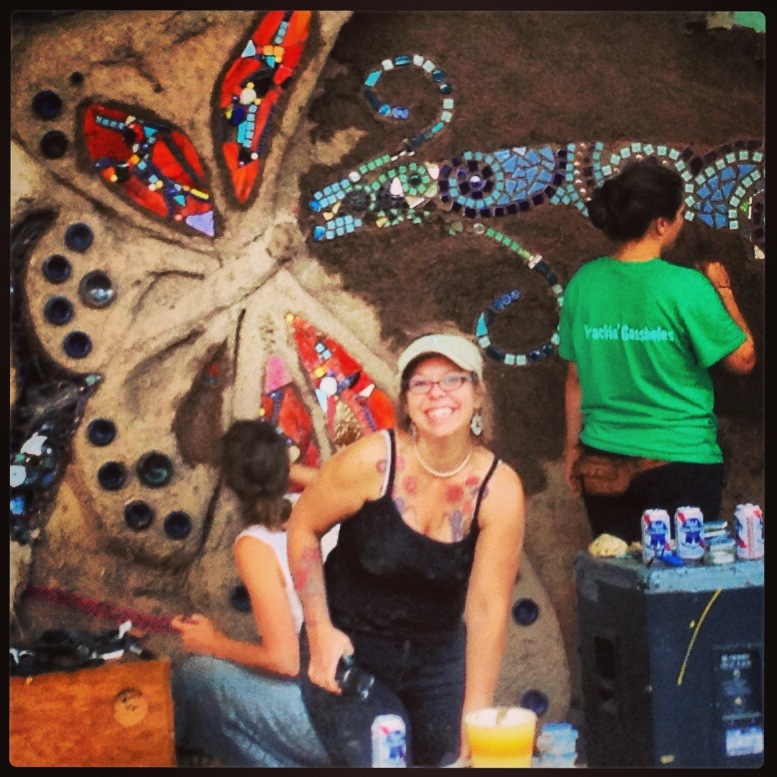 The wall was then covered with cob, and bejeweled by local artists with mosaics of all different materials. The goal of this Art Wall is to beautify downtown and connect the public and private sectors of the community. The Art Wall is just one example of the work that the North Fork Valley Creative Coalition is doing to promote and expand the local economy through the creative sector. The Creative Coalition began in 2010 as an informal group of artists who came together during the Vision 2020 discussions. These community discussions were focused on what the economy of the North Fork Valley will look like in the year 2020. Five major economic drivers were identified—Agriculture, the Arts, Energy, Health, and Recreation and Tourism. The Creative Coalition has since become the non-profit organization that is helping promote, inspire, and strengthen the Arts as an economic driver. In the Fall of 2011, the Creative Coalition was one of fifty communities to apply for the Colorado State Office of Economic Development’s Creative Industries Grant. In partnership with the Boettcher Foundation, the State awards these grants to creative communities to help “promote, support and expand the creative industries to drive Colorado’s economy, grow jobs and enhance our quality of life.” The NFV was one of fifteen communities to be chosen as an “Emerging Creative District.” This past June, the Office upgraded the Valley’s designation to a “Certified Creative District,” thereby awarding significantly more funds to the Creative Coalition to accomplish their mission. Executive Director, Susie Kaldis explains the goal of the Creative Coalition is to “bring awareness to people in and out of the State that the NFV has a lot of offerings—for foodies, wine connoisseurs, for people looking to come to a small rural area to experience high quality art, music, food and recreation.” Most businesses in the area only have budgets to market locally. The Creative Coalition serves as an umbrella marketing organization, helping local businesses and organizations reach various regional and state media outlets. One of the ways in which the Creative Coalition is helping artists has been the creation of the North Fork Valley Creative Directory. Much like the popular VOGA Directory which connects consumers with local farmers, ranchers, and viticulturists, the Creative Directory is a complete listing of the Valley’s artists, musicians, performers, and creative centers. If a business needs a website developed, they can connect with an artist who does this work through the Directory. With so many artists living in the NFV, I wondered what attracted this creative community to this place. “I really think it’s the natural beauty,” explains Susie. Recently Sarah Sauter of the Conservation Center presented the North Fork Alternative Plan to the Board of the Creative Coalition. “Having oil and gas rigs visible would definitely change the experience of the valley for residents and tourists,” says Susie. The Creative Coalition has concerns about oil and gas development in the Valley. The Board has passed a motion to write a letter to the BLM listing their mission and their concerns that oil and gas development along a scenic byway and in a creative district would adversely affect the mission, goals, and programming of the Creative Coalition. “We are moving out of an industrial age to an age where people can create the world they want to live in,” says Susie. What world do we want to live in here in the North Fork Valley? What walls and fences do we want to mend and which do we want to break?